Some days ago I get that link on Facebook, a BBC story about cat’s museum in Amsterdam. Felines have fascinated and inspired artists for centuries; worshipped in Ancient Egypt and made Instagram famous in the 21st Century. For many, the cat has been a companion worthy of immortalising in art. Bob Meijer founded Amsterdam’s KattenKabinet (Cat Cabinet) in memory of his beloved pet John Pierpont Morgan, which he owned as a student. The museum features depictions of cats in film, posters, photography, sculptures and music. It’s also home to two young cats, who are popular with the visitors. “The character of artists and cats are very close to each other because a cat is a very independent creature, he doesn’t listen to his master. An artist is also very independent, and that is why most artists love cats and not dogs,” says Meijer. I did. And I found, BBC sent it as one of world’s strangest museums. And I thought, oh jeemine, IT IS NOT TRUE! Helmut Glantz, a very nice older man, collects since 40 years all about cats – figurines, pictures, china, everyday items and selected objects for collectors. Mass products and precious uniques. Everything started with a small white china cat, which he bought for some marks being the pupil… Now all that cats got over the whole flat, the owner and his family (nowadays the wife only, the children growned up and moved away) and, of course, cats are living in another flat in the same house. Here is no place for living beings, here rule the reificated cat. And HERE. Nine cat’s museums in the whole world – the Amsterdam one is on the list, my two – even not. On the list below there are some further museums. Guess, what it is? 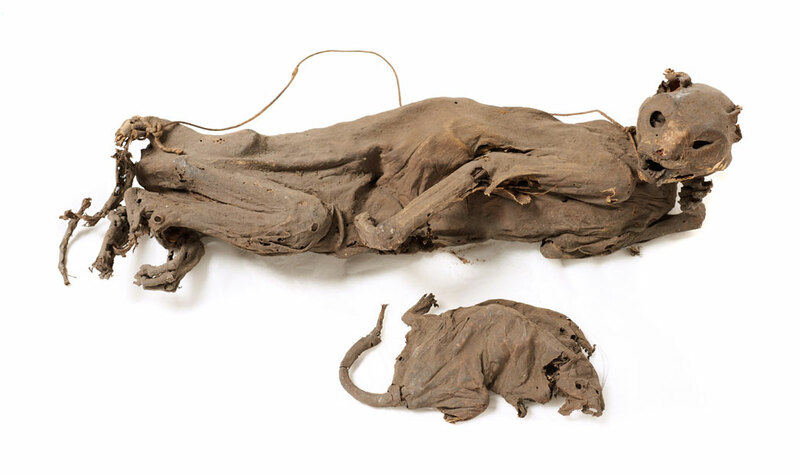 A mummified rat and cat, late 19th century; found together in a London sugar warehouse. Ten wpis został opublikowany w kategorii Ewa Maria Slaska i oznaczony tagami koty, Post in English, reblog. Dodaj zakładkę do bezpośredniego odnośnika.